SoulCalibur VI’s second trailer dropped today, offering players a glimpse at the 20-year-old fighting game’s upcoming roster. One constant throughout SoulCalibur’s shifting cast of fighters is the cursed villain Nightmare, whose new design was revealed today. In the first SoulCalibur, released in 1998 for arcades and 1999 for the Dreamcast, Nightmare’s design focused on three things: His claw of a right arm, the Soul Edge blade, and the horned helmet. His armor was plain and broken up by small bits of chainmail. That armor’s design isn’t very interesting, but it didn’t have to be: his torso-sized claw and gory sword said what it needed to say. Source: SoulCalibur Wiki. Project Soul reeled in Nightmare for SoulCalibur V. Here, he’s back to his SoulCalibur II look: Long red hair, a whole suit of armor, and no demon appendages. He looks very Dark Souls here. Credit: Onirockman. 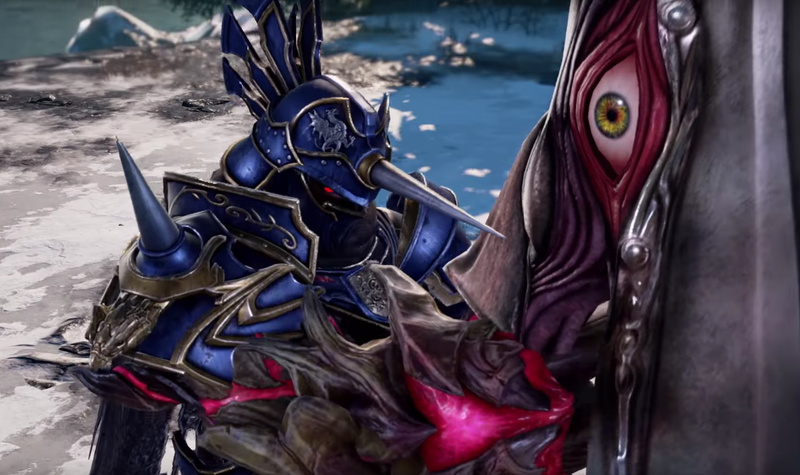 Revealed today, SoulCalibur VI’s Nightmare goes all in on the gold detailing. His armor looks way more refined than in previous incarnations. Here, he looks more like a dark knight than a possessed suit of armor. Project Soul sacrificed grit for glitz in this design—he’s way less scarier than he’s ever been. Credit: Bandai Namco.